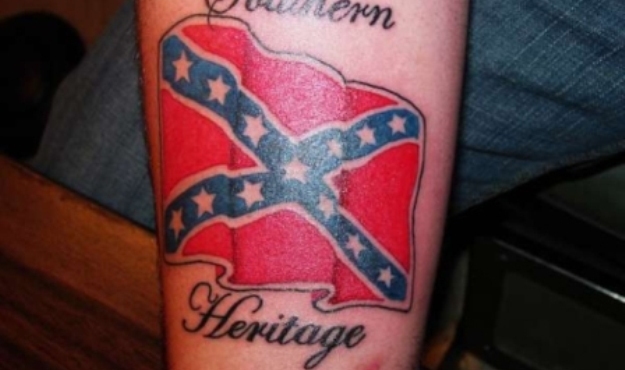 Rebel Flag Tattoos: 11 Inspiring Designs! - Picnic! 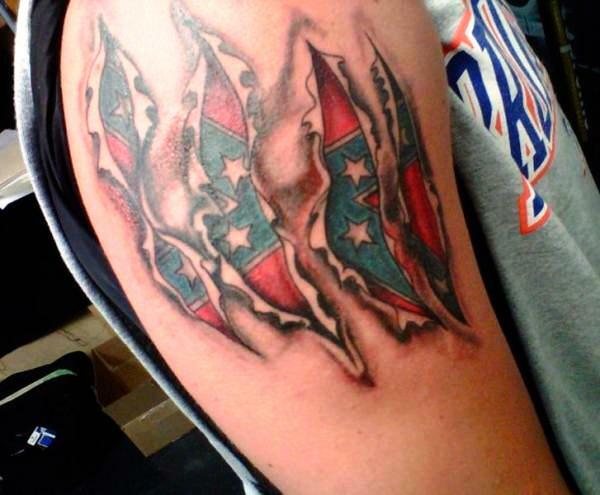 Rebel Flag Tattoos: 11 Inspiring Designs! While rebel flags and rebel flag tattoos have long been associated with racism, that’s not what they are about at all. In fact, rebel flags are just a symbol of Southern heritage much like someone from Thailand may get a tattoo of the country flag or someone that does Jiu Jitsu may get a tattoo of their school’s symbol. With that being said, we invite you to scroll down and take a look at our collection of rebel flag tattoos. If you’re from the South or just like rebel flags, we know that you’ll find a tattoo here that you absolutely love! So, what are you waiting for? Scroll down now! Also, if you like this list or a particular tattoo (or know someone that would), make sure you share this page with your friends! This rebel flag tattoo gives off the impression that something clawed the skin of the person in question and revealed the rebel flag tattoo underneath. In other words, it’s a great tattoo for those of you that like the outdoors or wild life as well as rebel flags. This tattoo is a perfect example of what we were talking about in the opening paragraph. Not only is it a rebel flag tattoo but it also show off this person’s Southern heritage. 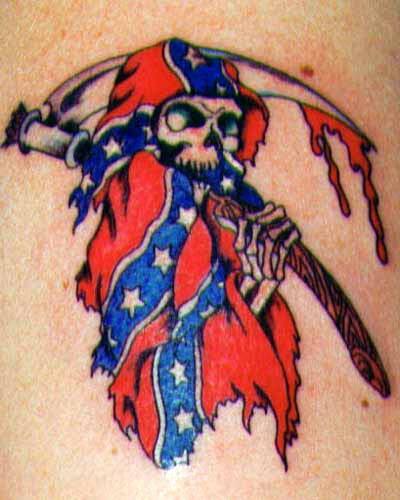 This tattoo blends the rebel flag with the Grim Reaper which some people are sure to like. It shows that you have Southern pride and aren’t afraid of death. If that’s your kind of thing then you may want to consider getting a tattoo similar to this one in the future. We never forget about women and this tattoo proves it. This tattoo is perfect for all you Southern ladies out there that have pride in regards to where you’re from and what you represent. 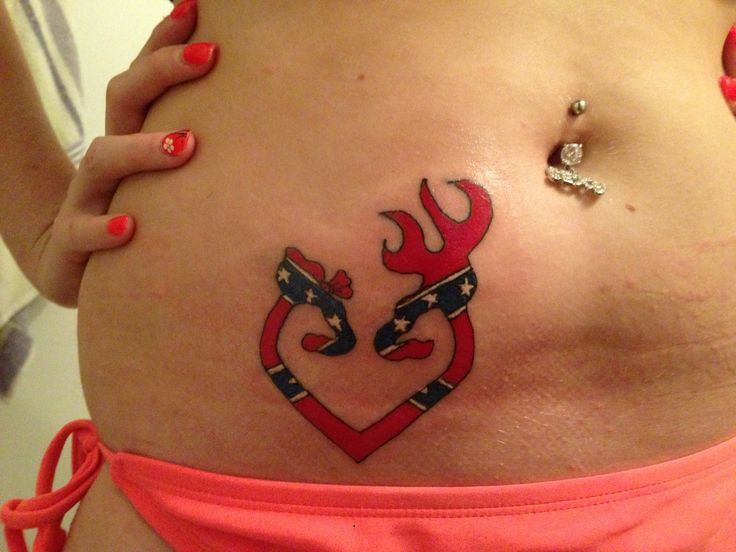 Best of all, this heart shaped rebel flag tattoo would look great anywhere! This is another great tattoo for you ladies out there as it is a rebel flag in the shape of a butterfly. As you may know, the butterfly is one of the most popular insects to get a tattoo of and when you combine it with a rebel flag, the results can be considered stunning! This Tinkerbell rebel flag tattoo is simply one of a kind. We haven’t seen anything like it before so we definitely had to share it. This would also definitely be considered a rebel flag tattoo for her and we hope all the ladies that check out this list like this tattoo! People sometimes forget about the fact that the rebel flag is in fact a flag. 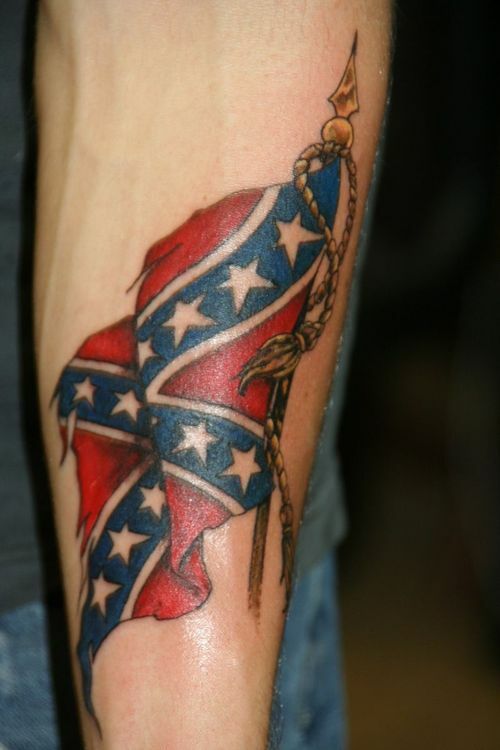 This tattoo shows it in that sense and we know that the die hard confederates out there will like it! This rebel flag tattoo has some interesting tribal around it and while we don’t like the quality of the tattoo very much, it is an interesting concept that was worthy of sharing. If you do decide to get a tattoo like this, make sure you get it based on the idea only. This rebel flag tattoo shows off a cool skull that we definitely think everyone will like. If you ride a motorcycle or just like skulls, this could be the pefect rebel flag tattoo for you. This tattoo is a combination of the Confederate Flag as well as the American Flag. If you’re an American and are from the South, why not show how proud you are of both facts? This tattoo is sure to be admired by all of your friends and envied by everyone around you. Finally, the last tattoo on our list is that of a gun alongside a rebel flag. We all know how much people in the South love their guns so what better way to show that off? If you like rebel flags as well as firearms then you will definitely fall in love with this cool tattoo. And that concludes our list of 11 Rebel Flag Tattoos. We know how popular these types of tattoos are so we will definitely be doing more in the future. If you have any suggestions or ideas, be sure to let us know. We just might use them! As always, if you know anyone that would be interested in checking out these confederate tattoos, share this list! We would appreciate it tremendously and we’re sure the person you share it with would too.